In 2014, art critic Pau Waelder published an ebook on the Merske Books website, titled $8,793 Worth of [Digital] Art, based on the representative value of the collective works he siphoned from the online art marketplace S[edition] . 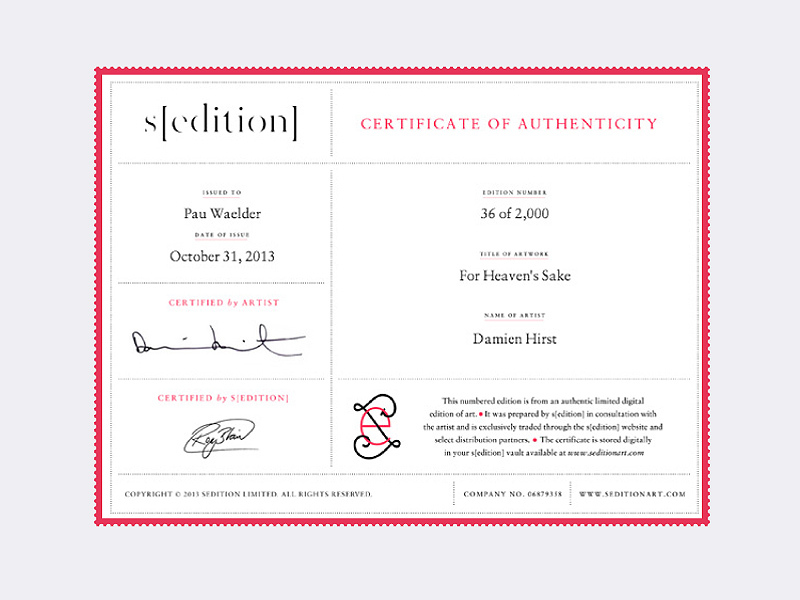 Over the course of 159 images of works of art lifted directly from S[edition]'s storefront, Waelder pairs each of these works either an authentic or unauthentic "certificate of authenticity," which is intended to only be given upon the official purchase of each copy of an art piece by an individual. However, a simple flaw in the website presentation allowed Waelder to reproduce the certificate - a blank example copy for each art piece is shown on the website proper, which Waelder copied and used to forge some of the certificates in his collection while the rest he officially purchased. These copies are indistinguishable from the real deal, forcing the reader to distrust what they see on the page as fact - an obvious metaphor for what debatably constitutes as "owning an official piece of art" in the contemporary digital landscape . Indeed, can any difference be found between these two "authentic" certificates? (Save for the art and artists' names, of course.) In fact, if one were to edit these two certificates using one's name instead of Waelder's, would that individual now own these two art pieces, too? This art collection clearly follows the spirit of Sherrie Levine's 1981 photographic reproduction of Walker Evan's famous Allie Mae Burroughs 1936 photograph (and by extension Michael Mandiberg's own 2001 digital reproduction of Levine's physical reproduction) - it definitely establishes itself as holding the same stance that other art critics directed towards Levine and Mandiberg's work, that "the ideal of originality associated with avant-garde art [is] a myth" following the concept of simple reproduction . However, this is by no means the full intent of Waelder's piece. In an interview with We Make Money Not Art, he explains that his piece is also meant to highlight the disparity between how purchasing art is handled in the digital world - which is performed similarly to purchasing physical copies in the real world - and how the natural dynamic of sharing data on the internet is done globally as an intrinsic, democratic feature. Even so, not all works of art can be pirated straight from the storefront of S[edition] and other sites - they offer art pieces such as digital installation works and videos, which are incapable of being lifted through website image rips alone . But in a digital world where copy-paste maneuvers are commonplace and file sharing is the norm, who can accurately determine the authenticity of any piece of art over the internet? Martin, John, and Pau Waelder. “Merkske.” Pau Waelder, Merkske Books, http://merkske.com/worth/. Regine. “$8,793 Worth of [Digital] Art.” We Make Money Not Art, 7 Dec. 2015, http://we-make-money-not-art.com/8793_worth_of_art/. Shanken, Edward A. Art and Electronic Media. Phaidon, 2014.